I exchanged emails with the super-cool Kiersten of Mod Mom Furniture a year or so ago and her fabulous wares have been on my must-blog-about-list since then, and somehow I just haven’t managed to make it happen. So I need to apologize to you, dear readers, because I hate to think I hadn’t shared such a fantastic find with you earlier. Kiersten is the real deal. She sits in her old garage, surrounded by powertools, and she designs then builds gorgeous furniture. Because she’s fearless like that. 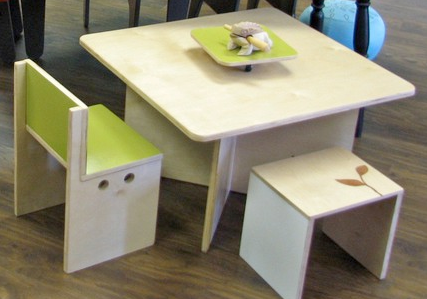 Each piece is hand built by Kiersten using eco-friendly birch plywood, non-toxic finishes, and slow-closing lid support. 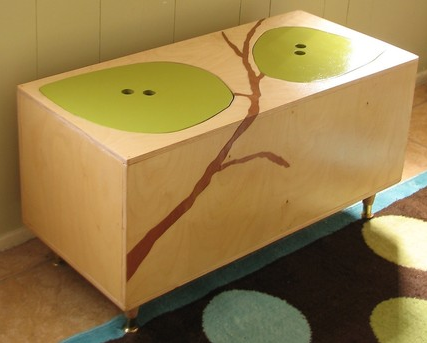 The Bertie Box is my favorite — what a perfect addition to the play room! Thanks for the post! As for the daddytypes link, here’s my two cents on the subject. I have to say I’m really sad to know some “design-concious” people will continue to bash without really knowing the whole story. I love it! I am so impressed when someone does something so creative with their hands. I am just starting to sell some children’s art and it is so hard to balance with motherhood. SO WAY TO GO! It’s beautiful! I absolutely love those storage benches! 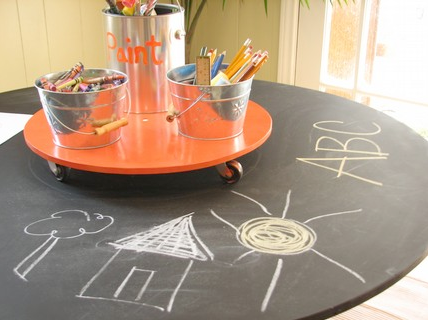 I have got to have that adorable chalk board table… I am in love. I am going to post it on my blog as well! Thanks. 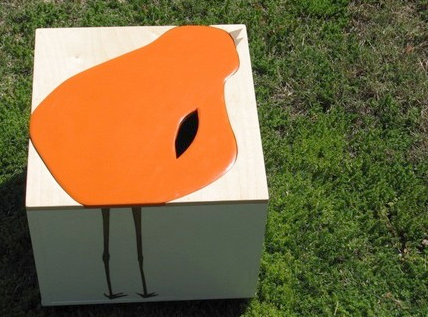 Kiersten, I think your furniture has timeless sensibility….which cannot be trademarked/copyrighted! I wish you all the success….you’ve earned it with your brilliant products!